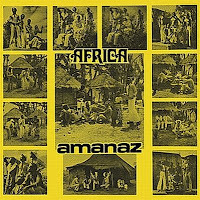 FuzzyWasabi: Amanaz - Africa : African Psych… did you know it existed? Amanaz - Africa : African Psych… did you know it existed? Well, until I stumbled onto this LP, I would never have thought Africans could have set their minds onto this peculiar genre… No offense meant, but this has a very strange feel to it. Although dating from 1975, it has the hallmarks of period end-60's psych, full-on fuzz, droning songs, while maintaining a very "African" feel. This is not Afrofunk, it is a bunch of guys sitting under the baobab tree and who decide to make music after listening to way too many pirate radio stations. Obviously, the radio programs in Zambia were a few years behind the US and European trends. At the time when the mainland was getting into progressive music, these guys were making period 67-68 psych. I forgot to tell you they sound doped up most of the time… as in "too many spliffs, brother". Apart for a couple of songs that could be passed over, this LP has a timeless quality and will insidiously creep on you. Love it or hate it: here's african fuzz! this isn't insidiously creeping up on me...it's rocking my world...wow.. Some of them released records. I will try and check these bands out! Oi, I've just added your Reis do Yéyé blog on my blogroll to the right.